12 July 2017. 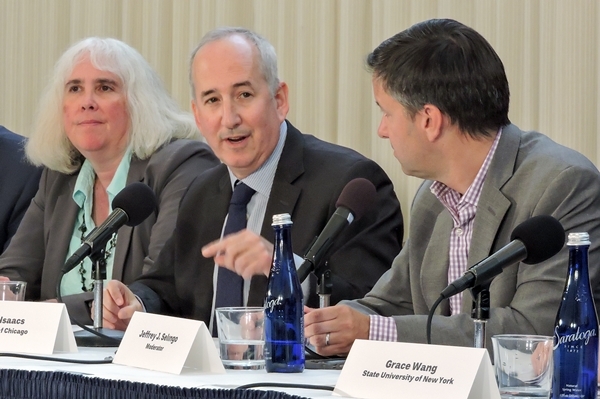 A panel of research executives from American universities said the current hostility to immigration in the U.S. is causing fear among many researchers and could have a serious impact on science. Immigration and proposed large cutbacks in funding for overhead costs were among issues causing the most concern for 11 university research officers, assembled at a press conference today by The Science Coalition and Association of American Universities to discuss the state of American science. Eric Isaacs, vice president for research, innovation, and national laboratories at University of Chicago said that immigration crackdown could have a “damning effect on attracting talent.” He noted that his university is responsible for two national laboratories — Argonne and Fermi national labs — both during research on an international scale, requiring collaboration with scientists worldwide. Jeanne Hossenlopp, vice president for research and innovation at Marquette University in Milwaukee, warned that the hostile climate towards immigrants, not just the Muslim ban, was causing fear among its researchers. She added that the real impact won’t be seen until the Fall. Denis Wirtz, vice provost for research at Johns Hopkins University in Baltimore, expressed concerns about that institution’s foreign students returning in the Fall. “The best international students have options,” said Wirtz, adding that countries like France are making overt attempts to steal away top foreign students at American universities. Another topic worrying research executives is proposed elimination of support for research overhead, costs of goods and services supporting research activities overall at an institution rather than attributed to a specific project. While the topic seems at first to be an arcane accounting matter, the scale and purpose of the proposal are raising alarms. At a congressional hearing in March, Health and Human Services Secretary Tom Price said the Trump administration would pay for a $5.8 billion cut at National Institutes of Health by eliminating overhead payments to universities and research institutes. Last year, according to Science magazine, NIH paid $6.4 billion in overhead, about 27 percent of its research spending. Daniel Lowenstein, vice chancellor and provost at University of California in San Francisco, pointed out that these funds pay for an institution’s research infrastructure, and if cuts of this scale go through, “it will destroy science.” Isaacs added that unlike companies that do research with short-term payoffs, universities conduct research with benefits for extended periods of time. He cited the Manhattan project in World War II to develop the atomic bomb as an example of long-term science that benefits national security. Despite mixed support, at best, for science from the federal government, a number of research executives are finding individual states and cities are stepping up for research. Grace Wang, vice chancellor for research and economic development for the State University of New York system, said in New York and other states like California, the state government is increasing its support for clean energy. Isaacs noted mayors often are interested in local activities of universities, and good vehicles for involving the private sector.